Maria Rodriguez Bernal is an experienced CBT/Psychological Therapist who has worked in both the NHS and private sector. She has a BSc in Psychology, and Diploma in Psychological Therapies (Cognitive Behavioural Therapy Strand). She is also a Member of the British Association for Behavioural and Cognitive Psychotherapies. Maria has over 13 years’ experience as a Therapist, offering support to adults suffering with mental health difficulties. Maria covers issues such as Anger, Depression, Work and Career Related Issues, Phobias and Fears and Obsessive Compulsive Disorders. She offers a variety of approaches to better tailor the treatment needs of clients in a holistic, balanced and reflective manner. Maria draws from a combination of cognitive and behavioural approaches, including Cognitive Behavioural Therapy (CBT), Dialectical Behaviour Therapy (DBT), compassionate mind and Acceptance and Commitment Therapy (ACT). Maria is described as a warm, sociable, honest clinician, with a sensitive and conscientious approach to her work. 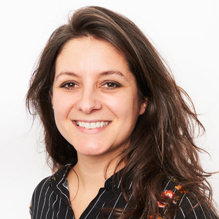 Clinical Partners are delighted to present Maria Rodriguez Bernal as part of our Exeter team. You don't need a GP referral to see Maria Rodriguez Bernal.